German administrators have impounded a jet used by Thailand's Crown Prince Vajiralongkorn, in a dispute over an unpaid debt from 20 years ago. The administrators say Thailand's government has refused to pay a bill of more than 30m euros (£26m; $43m) to a now-defunct German construction firm. 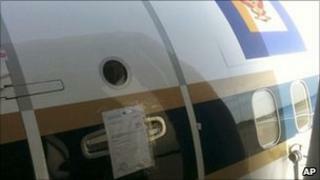 The Boeing 737 was seized by court order, and will remain grounded, said a spokesman for Munich airport. Thailand's Foreign Ministry said the seizure was "highly inappropriate". "The Thai authorities have expressed to the German government its great concern over the incident and have requested it to resolve the problem as soon as possible," ministry spokesman Thani Thongphakdi told Reuters news agency. But Walter Schneider, the administrator for the now-bankrupt construction firm, said the "drastic measure" was "virtually the last resort". "The Thai government always stalled and did not respond to our demands," he said. The German firm was part of a consortium that helped to build a toll road between Bangkok and Don Muang airport. The Thais claim a court decision is still pending on the debt, but the German administrators say the matter has already been decided.